Eagle Forklifts staff have over 75 years combined experience in forklift servicing and forklift repairs of internal combustion forklifts and electric warehousing forklifts. We provide forklift servicing and forklift repairs to all makes and models. We have an advanced fleet management system and a modern workshop facility to keep your forklifts in the best working order. 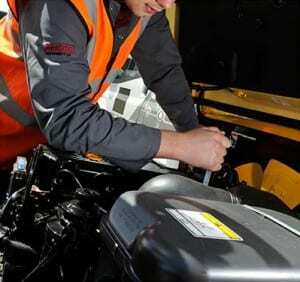 Our mechanics ability to diagnose and repair many forklift faults and our extensive spare parts division provides us with the ability to have the majority of repairs carried out on the same day they are discovered. On-site forklift servicing options range from minor services and fixed price options through to comprehensive servicing. All forklift servicing and forklift repairs include a free 54 point safety check with a written report detailing any mechanical or safety concerns with your forklift and what to keep an eye on between services to minimize forklift repairs in the future. Eagle Forklifts spacious, modern workshop has all the tools needed to add or alter attachments or modify your forklift to suit your changing operations. We can provide all legally required inspections and certifications including safety, mechanical, road worthy, LPG and NGV for your forklift. Legally required inspections will be notified to you when forklift servicing or forklift repairs are provided to your forklift. NEED FORKLIFT SERVICING OR FORKLIFT REPAIRS? GIVE US A CALL!